Roasting tomatoes brings out all their natural sweetness. When beefsteak tomatoes are at their best, use them to make this easy, delicious, spectacular Eggs Baked in Tomatoes breakfast or brunch dish. 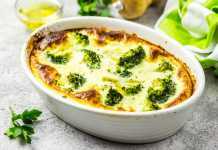 Better yet, this dish happens to be perfect for those on restricted, anti-microbial or neutropenic diets. No one could feel deprived for one minute eating this! 2. Slice the top quarter off of each tomato. Using a paring knife or spoon, carefully core the tomato. 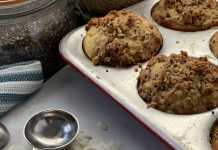 Transfer to a 2-inch deep baking pan lined with parchment paper. Drizzle with olive oil, salt, pepper, and some chopped garlic. Bake for 20 minutes, or until the tomatoes have broken down slightly. 3. 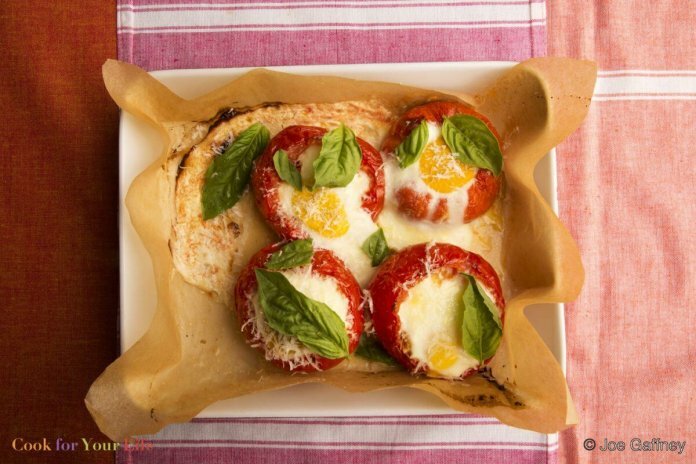 Remove the pan from the oven and carefully crack an egg into each tomato. The egg whites will dribble out. Return to the oven and cook for another 6 to 8 minutes or until the yolks have just set (cook until completely hard if on low microbial or neutropenic diet). Top with some Parmesan cheese and return to the oven for another 1 to 2 minutes. 4. Serve warm or at room temperature with fresh basil. If you’re on an anti-microbial or neutropenic diet, or cooking for someone who is, shred the basil garnish and add it to the tomatoes along with the garlic in step 2, tucking it into the cavities of the tomatoes. This way, you can have the summer taste of basil without the worry of germs.